The textured popcorn ceiling was very popular back in the day. You can modernize your home by removing it. 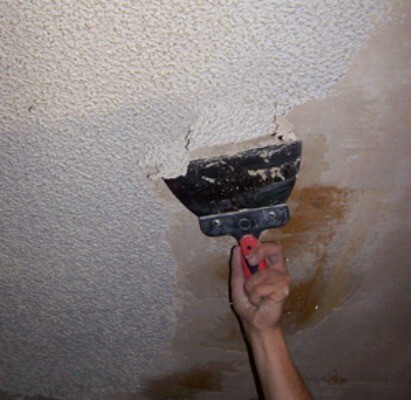 This is a guide about removing a popcorn ceiling. 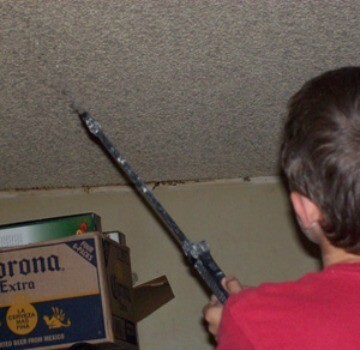 if you are like me, living in a older home with popcorn ceilings and hate them as much as I do, this might just be the home repair you would most like to do. Removing a popcorn ceiling is a very easy job but it is very messy and it is not the kind of project that you can do with moving the furniture from one side of the room to the other as you will be sure to get it all over. First, make sure to clear your room of any, and all furnishings. I also, must tell you about a tool that I bought to do the job and it turned out to be useless. I paid 16 or so dollars for a scraper on a long pole that you attach a bag to. It was supposed to minimize mess. The scrapings from the ceilings were suppose to go into the bag as you scraped. It was very hard to get the right angle on this scraper so my son made some pretty bad gouges in the ceiling. The bag filled up alright but it got too heavy and started to tear. You are better off using a wide blade scraper and a ladder. Less strain on your back and you get a better result. First fill your sprayer with some warm water. Now starting in a small section (3ft by 3 ft) spray down your ceiling with the warm water. Make sure you get it nice and wet. Wait a few minutes and then with your wide blade scrapper start scrapping. You want to get the ceiling right down to the drywall but be very careful that you do not gouge it. Continue on until you have removed all of the popcorn ceiling texture. We found that this process went even faster if one person sprayed sections of the ceiling and the other person did the scrapping. Depending on the size of your room and if you have two or more people working you can easily have that popcorn removed in a couple of hours. Now is clean up time. You can sweep the debris into piles and then put them in trash bags. When we were done I was pretty impressed with the swirls and un-even texture of my ceiling. So we just primed and painted it. If, however, you would like a nice smooth ceiling you will need to use joint compound to put a new texture on your ceiling. This is very easy. You are going to make a skim coat on the ceiling. With a wide scraper apply a thin coat of dry wall to your ceiling working in one direction only. Again work in small sections. Joint compound has a long work time so don't be afraid that it will dry out. There are many patterns you can make for your ceilings or you can just keep it smooth. If you want you can have another person go over the joint compound with a broom or a sponge to make a unique texture. Keep doing this until your ceiling is completely covered. Let this dry for 24 to 48 hours. Once your ceiling is dry you are now ready to prime your ceiling. Any good primer will do. Some of the bigger name paint companies have even come out with a paint/primer combination then, you only have to paint once. Behr is one of these companies. Hope you enjoy your new and improved ceiling! Editor's note: Popcorn Ceiling texture can contain asbestos, make sure to keep your respirator/mask on for removal and clean up. Use moist towels and sponges that you don't mind throwing away to clean up excess dust. What is the easiest and safest way to get rid of cottage cheese ceilings? You have to cover the whole room in a big sheet of plastic. Then use a cheap $12 garden pump-sprayer filled with water to saturate the whole ceiling and let sit overnight, then come back and saturate the area you are going to work on again and let that sit for half an hour or so. Then using a large, flat paint-scraper and start scraping the wet popcorn off the ceiling. You should be wearing one of those white paper cover-suits and and a dust mask. Put the white cover-suit into a plastic bag before leaving the room. It also helps if you add a squirt of dish soap to the water you are using to wet the ceiling. A sponge soaked with the wetting-solution can also be used to wet small areas. 1) Add 1 part of vinegar to 10 parts water. 2) 1 cup ammonia, 1 cup of fabric softener to 1 gallon of water. At least 50% of popcorn ceilings have asbestos in them. After a house fire, we had to pay the haz-mat guys to come in their white suits and respirators to remove ours. It's safest to first have some of it tested before you subject yourself and your family to the possibly of danger! I would call your local county Health Department and ask them for more info about testing. * If you decide to go ahead without pre-testing for asbestos, remember that you need to keep the area soaking wet, because once it dries and turns to dust, it can easily be inhaled. Make sure children and pets stay out of this room until the whole room is completely cleaned (ceiling to floor) and there is no possibility of dust! Also, use caution when cleaning out your vacuum cleaner! How do I determine whether asbestos is in my popcorn ceiling? We are planning to demo it and I want to be safe. I have heard that lab-testing is the only way to see if asbestos is present. I've also found online that since the asbestos ban, there have still been ceilings with it in it (I don't know how). Does anyone have a specific tip on how to safely demolish popcorn ceiling yourself? And how to determine if it has asbestos? Is lab testing the only way? I have "heard" that the times you have to be careful with it is when it is in dry form (like sanding it off). If you wet it, then it gets rid of the air-borne particles that you could inhale. I did my kitchen using a spray bottle and scraped it off but it would be best to ask at your home improvement store if this is correct. I probably read that somewhere and hope I remember right. Do I just use a paint scraper and then sand the wallboard before repainting? Popcorn ceilings most often have asbestos in them. Asbestos is carcinogenic. It is dangerous to disturb the popcorn particles. You need to have a small sample checked for asbestos, and if positive for asbestos a special crew needs to be hired. My husband died last year, partially due to asbestos exposure. Please be careful. With or without asbestos, this is an awful job. You need to get some good advice and instructions about it if you are going to tackle it yourself. Try googling for information, or visit your library for some home improvement books which might have that information. I live in a manufactured (double-wide) home. I want to remove the popcorn ceilings and paint them. I've seen remodel projects on HGTV, etc., but they never seem to explain the process. Do any of you have the directions? My understanding is that spraying water on it will soften it and allow it to be scraped away. If it is oil based paint though it might be more difficult. But you just have to take it more slowly and get a start to it any way you can and then spray the edge of the popcorn, not the actual surface, thus getting water UNDER the surface of the oil based paint. Messy messy job and not at all easy on the arms and neck. You are to be commended to even start. Sometimes the popcorn is there for a good reason, i.e. a bad drywalling job in the first place. Putting up firring strips and then a thin and therefore light in weight wallboard to begin anew is not a bad idea. Good luck! On Sell This House on A&E, they sprayed water on it and the popcorn came right off. They used a wide putty knife to take it off. they started with a hand-held spray bottle of water, but in the end the homeowner got the hose and sprayed the water on the ceiling with the hose. It was much quicker that way. Of course, they had plastic drop cloths over all the walls and the floors. What is the best way to remove the popcorn texture from a ceiling? Most popcorn ceilings have asbestos in them and you should not paint or remove them yourself. Have a chip tested. Can anyone tell me an easy, or at least fairly easy, way to "un-popcorn" my ceiling? I want to take all the popcorn stuff down and paint it. Cricket, please have it tested before you even attempt to remove it unless the popcorn is less than about 15 years old! Even though asbestos products were banned in 1978 the existing supplies at that time were not banned and could continue to be used! Call a local hardware, paint store, etc to see if they carry test kits. If it turns out the test says 'yes' then you truly need to have a professional come in and remove it or there are special ceiling tiles that you can purchase and place over the popcorn. Sorry just getting around to reading TF. I saw this done on Trading Spaces or some show on HGTV. Everyone else is right, you have to be concerned about asbestos! That being said- our house was built in early 1970s and has original tiles on the floor. I was pretty sure by their look that they were asbestos. Called Health Dept. for advice on testing and removal. Their expert told me I could bring a small piece in to have it tested for free if I wanted to, so that's an option. He also said that to remove something that has asbestos in it, like floor tile, it is important to get it wet so that it keeps the dust down so you don't breathe it. Wear protective clothing, gloves and mask over mouth, nose and eyes. Now, as to the ceiling, ours probably has it there too, but we removed it from the kitchen anyway. We went to the hardware store and bought a NEW thing that you use to mix and spray your own pesticides. I don't remember what they're called but it's a plastic canister you pump with air that has a hose and trigger to spray (DON'T use one that's been used for that purpose, buy a NEW one!). Put painter's plastic over floors and counters. Put warm water in the sprayer and use it to spray the ceiling (maybe 5'x5' section at a time). Check this ThriftyFun post: http://www.thriftyfun.com/tf83829211.tip.html for a step by step article on removing ceiling texture. Can you scrape off popcorn from a ceiling?